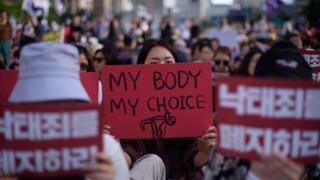 The push for change comes from a burgeoning movement fighting for women's rights in South Korea. Pro-choice campaigners say the abortion ban is part of a broader bias against women in the country. As the cheers of celebration rippled through the hundreds who'd gathered to fight to overturn the abortion ban, two women stood hugging. One in tears. She'd had an abortion in the past. She'd hid her decision for years, even from her close friends, because she felt ashamed. But today she said she felt she could breathe and that her choice finally felt valid. The stigma was gone. Others in this mostly young group of women told me this landmark ruling finally made them feel that female voices were being heard in what is a deeply patriarchal society. On the other side of the road a group of anti-abortion activists shouted "down with feminism". They believe this ruling will not stand and that there is a chance to fight on. The Constitutional Court's decision has put the next step into the hands of politicians, who have until December 2020 to re-write the law. These conservative groups believe they can influence that process. Teenagers who get pregnant are often forced to end their studies or transfer to remote institutions, according to youth rights groups.